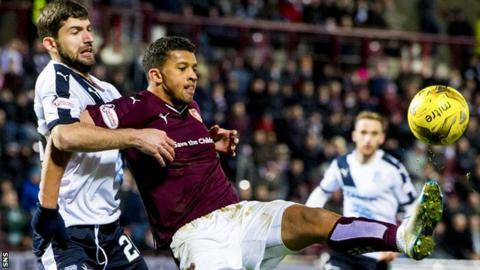 Hearts head coach Robbie Neilson was left frustrated after his side drew 1-1 with Dundee at Tynecastle. Arnaud Djoum had given Hearts the lead in the first half but this was cancelled out by a Rory Loy strike midway through the second period. "I thought we were poor," Neilson told BBC Scotland. "The first 20 minutes we dominated and were on top of the game. We created a lot of chances and then went to pot really." Neilson said complacency within his team may have led to Dundee being allowed back into the game, which saw them miss the chance to close the gap on Premiership leaders Celtic. "We never performed or moved the ball quickly enough and started going through the motions," he said. "I think sometimes when you score a goal like that then you will get another one quite easily. I try to install into the players you have to go and earn it. "We just went flat, the whole place was and we didn't give the fans the energy." Neilson said one positive from the game was the performance of midfielder Djoum. The former Belgian Under-20 international scored his third goal for the club after another excellent all round performance. "I thought Arnaud played really well. In that number 10 role he played really well, but we had to move him out because of injuries and shuffling people about. We didn't get the same directness from him." Meanwhile, Dundee manager Paul Hartley felt his side were more than worthy of their point. "Especially in the second half." Hartley told BBC Scotland. "I thought we were terrific and possibly could have won it. "I felt the first half Hearts had a lot of possession but never really cut us open apart from the goal that came from a wide area." The point was enough to take Dundee back into the top six and Hartley says he is now looking for his team to kick on up the league. "I think it's an excellent point. Teams have come here and get turned over properly. We have showed that there is more about us and we are hard to beat. "We have had four defeats all season. I know we have had a lot of draws but it shows we are a proper team and we have great desire there." Hartley spent four years as a player at Tynecastle and this was the first occasion he had managed against his former side at this venue. He says though it is difficult to enjoy a 90 minutes in the dugout. "I'm not sure you can ever enjoy being in the dugout for 90 minutes. I think it is emotional. You enjoy Monday to Friday but Saturday's can be difficult."